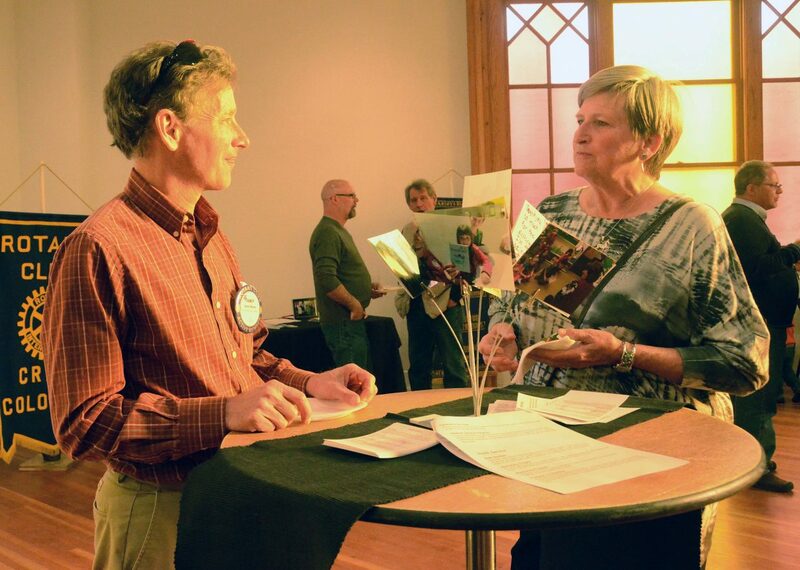 Rotarian Randy Morton and Teri Mansfield chat at the Rotary Club of Craig's mixer Thursday night. The Rotary Club of Craig took a break from its regular community service projects and fundraising to host a mixer Thursday night. “Rotary is a community organization, focused on how to make our community even better than it already is,” said Rotarian Sue Goodenow, who will become the club’s president in the summer. The event encouraged people to mingle and also to consider becoming a Rotary member. “We’re such a variety of community members in this club, and we come from diverse occupations so we fit in so well” to Craig, Goodenow said. Longtime Rotarian Neil Folks said the mixer was a chance for non-Rotary members to see what the organization does for the community. The mixer is for the “community being more aware of what Rotary is all about,” he said. Folks and Goodenow were enthusiastic about the literacy and youth programs Rotary offers. Through mentoring, distributing personalized dictionaries, reading to classrooms and leading Passport to Reading, the Rotarians have made concerted efforts to boost literacy in Moffat County, Goodenow said. They also give back with scholarships. The Rotary Club of Craig awards two scholarships to graduating high school seniors, one for nursing students and another for single parents. The organization gets most of its funds for these service projects via its two largest fundraisers: Diamond & Spurs and the Flag Project. Dana Duran, executive director of the Northwest Colorado Boys & Girls Club, attended the mixer to show support for the club. “I think Rotary is an exceptional community service organization and to be a part of it and see what they do is really important,” she said. Rotarian Katie Grobe said she was enjoying her first year of membership with the club. “I find it really encouraging, being a part of a partnership to serve the community,” she said. Contact Erin Fenner at 970-875-1794 or efenner@cragidailypress.com.